I’m a regular at a coffee establishment in my neighborhood; I consider the table facing the doorway my office away from my office. The manager of this coffee establishment, a soft-spoken ringer for Ringo Starr, is my friend and we chat once or twice each time he’s there. 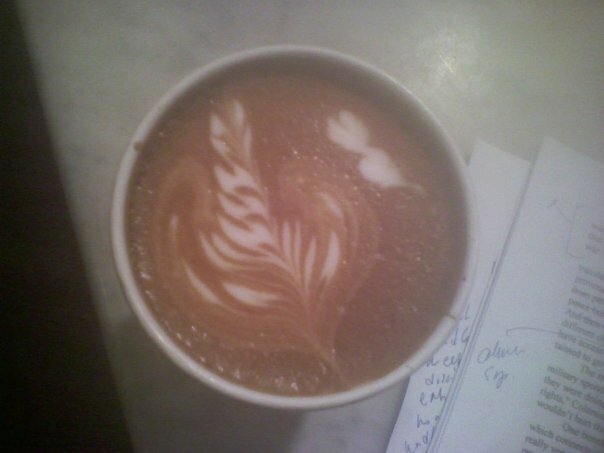 This manager is also a skilled barrista. 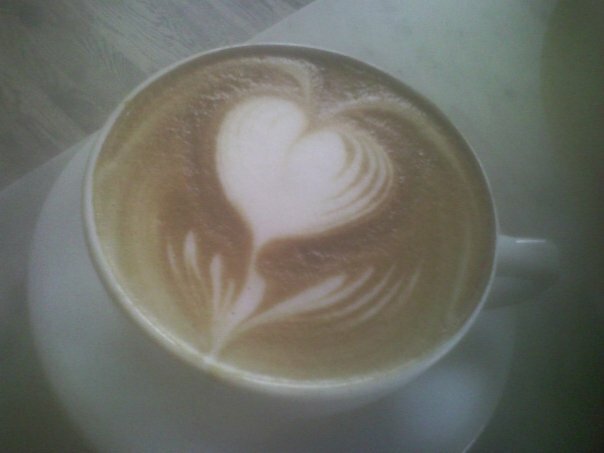 His leaves and hearts — the shapes milk is formed into on the surface of lattes — are uniform, sculpted, perfect. 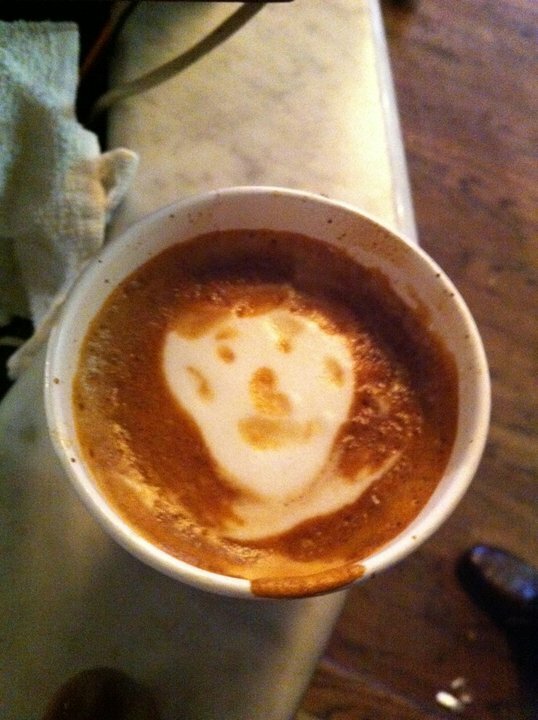 He and the other staff members have also raised looking like a barrista to an art form. They all look like Beatles, or like people who could be Beatles. NYC health law must require them to wear hats, but the NYC health law never envisioned so many different kinds of hats. Mets hats, Dr. Seuss hats, ironically and therefore festively taciturn hats. Uniform cool. 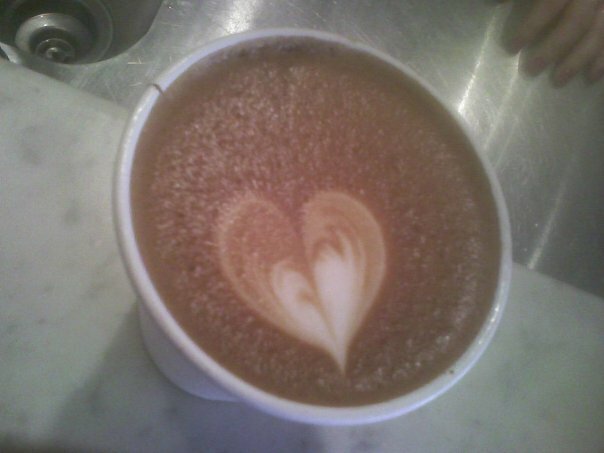 But the barristas are not only cool, they’re unfailingly calm. It may just be that they’re young, but there is something about the way the staff at this particular outpost of this coffee establishment never seems to get rattled which makes it a wonderful place to come and work. Seating in the coffee establishment is disorganized, random. There are a lot of tables and chairs, but there isn’t really a lot of space. So people sit right up against each other, Paris café-style. Seats are chosen by view out the floor-to-ceiling front windows, access to computer plugs. People come to work despite the often-loud music playing — ranging from opera to The Roots — and the loud talk. For me, the chatter mixed with music = white noise; but I have my limit — people who sit down next to me when I’m CLEARLY working, take out their cell phones and settle in for a long call. I do my best to politely (but never verbally) discourage this. I watch the street life. A woman wanders by on a very hot day dressed in black and carrying a black umbrella. The bus comes and goes. The witty, belligerent crazy person causes problems, then leaves. Interesting boots go by (and legs to go with them). Dogs. Dog owners. I inventory faces, people as they come in. The looks are usually optimistic: people are meeting someone, they’re here to finish something, recharge. There are groups of writers, groups of friends, people conducting interviews, having semi-serious meetings. And here and there are the single occupants like me, writers writing and looking, with the frequency of looking depending on the current success of writing. Every now and then someone unusual: Naomi Watts came in with children and a nanny. A city advance team staked out the place when Obama came to speak on Wall Street and one of the team members sat down next to me. We ended up swapping tips on bringing up teenage girls. An apparent fan of writers came in, ordered a cup of coffee and sat down, glancing around the room furtively. “What are you writing?” he finally asked, coming over. “A short story,” I said. “Cool!” he said, satisfied and went back to his seat. One particular regular has perfected the art of the write and look — except he doesn’t write, he just looks. He’s a large guy, friendly but somewhat forbidding. I recently came in to find him sitting in the seat next to my usual perch. I hesitated. Even if one is writing an important story on deadline, which I wasn’t, there isn’t always very much which separates a writer writing in a café from a guy with an empty cup just looking. I sat down and started in. I wrote; he sat and looked. People came and went. He sat and looked with his empty coffee cup. I scribbled and looked up with my slowly emptying coffee cup and plate. I kept hoping he would leave and be replaced by someone younger, prettier, conscious. He had a way of feinting movement, in which his body would pitch forward slightly, as if he were about to move, but then he would not get up. It seemed as if he did this six or seven times over a period of an hour. I swore to myself I wasn’t leaving. I kept trying to concentrate on what I was writing and he kept staring into the middle distance. I was about to admit defeat, when he stood up, smiled genially, and asked if I could hold his place while he went to the bathroom. I apologized and said I couldn’t because I was leaving. For a while last spring I decided to see if I could sate my latte craving with a home version. I had an espresso maker, but nothing to thicken or foam the milk. I bought gadgets: Hand-held milk foamers; a milk scalder. The Ringo ringer manager, whose name is Ben, suggested strategies. I bought the right espresso. Got my proportions right. Ben decided we would have an appointment. It took a while — we kept having to break the date or saying we’d make it and not following through. In the calm barrista world, this seemed right. Cheerfully keeping a running unconsummated date forever. I was positioned behind the counter but at the corner, out of the way of the action. I did not have to wear a hat, though I would have. It was a not so busy afternoon. Ben is particular. The espresso is decanted with a slapping sound and then tamped down, the excess is carefully cleared off before the filter holder is attached. A button is pressed and just the slightest bit of espresso is made — less than I’d expected. The milk, which is kept on ice under the machine, is heated and thickened to between 120 and 140 degrees, then stirred. Next comes the pour. Ben holds the milk pitcher close to the lip of the cup, then pulls it away, then brings it close again and jiggles it back and forth slightly before drawing it across. The jiggle forms the leaf edges, the final draw the stem. As a bonus, I got to make my own. The result was neither a leaf nor a heart, but a friendly-looking blob. One of the staff pitched in with a straw to add features. 3 comments to Wake Up! 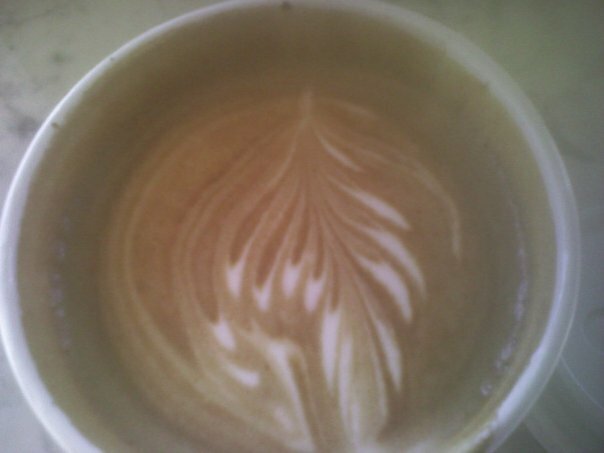 I’m a regular at a coffee joint (well, hardly a joint–more like a salon) and they make beautiful leaves in their cups. We have a foamer at home–a source of deep pleasure (except when it comes to washing it–milk is sticky). Anyway, makes me wonder what the name of your place is. Excellent web page! I thoroughly enjoyed your content material …very well written. Made me long for the days when I had the time (and assignments) to write in a public space…Will you reveal your coffee shop’s name, I wonder?